In fairness to British cuisine, there’s a lot of it that I like – Toad in the Hole, Ploughman’s Lunch, Bangers ‘n’ Mash. I even genuinely like Haggis* as long as I don’t think too hard about what’s in it. By the same token, however, there’s a lot of British food that’s fairly inexplicable – Bubble ‘n’ Squeak, kippers, kedgeree (for breakfast? really? ), blood pudding. One of the many moves of my childhood was to Hong Kong where I acquired a pristine British accent (it didn’t last, much to my parents’ disappointment) and a somewhat curious fondness for baked beans on toast (from a can, on the whitest bread you can find – I make very good homemade baked beans; they don’t taste right on toast). 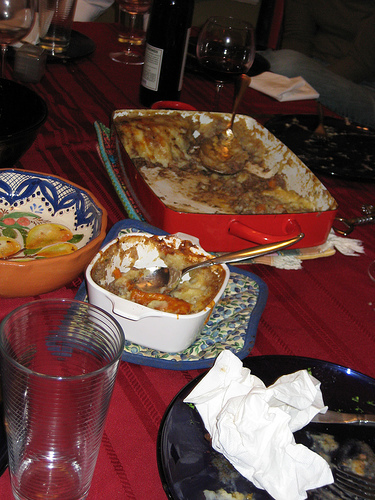 I did not, however, pick up a fondness for Shepherd’s Pie because the filling is usually watery, the mashed potatoes are gluey, and the whole thing is a festival of blandness. About 10 years ago Britain got tired of its reputation as a land of lamentable food, and there was a rash of bistro pubs that opened making gourmet versions of traditional pub food. This Shepherd’s Pie would be right at home on one of those menus. Mind you, the recipe comes from an Italian chef who lives in California, so it’s probably about as far from a traditional English Shepherd’s Pie as you can get and still have it be recognizable. * Yes I know it’s Scottish, but I used to eat it at a pub in Edinburgh so in my mind it’s pub food. Dinner now comes with pictures courtesy of my parents and my birthday. – Heat olive oil over medium-high heat. Brown the lamb and beef. Remove the meat from the pan with a slotted spoon. You will probably want to drain most of the remaining fat at this point because lamb gives up a lot of fat. – Add the onions to the pan and sauté until the onions are tinged brown at the edges – about 5 minutes. – Add the chopped carrots and cook for 5 minutes. 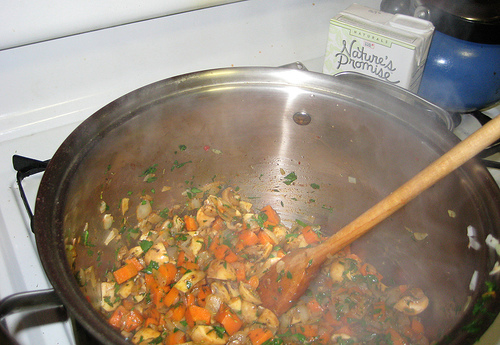 – Add the mushrooms, tomato puree, thyme, parsley and cinnamon. Stir and sauté for 2 minutes. – Next, stir in the flour, which will soak up the juice, then stir in the wine and the beef stock. – Taste and add salt and pepper, as needed. – Return the meat to the pan and bring to a boil. – Cover, turn down the heat to low and simmer for about 30 minutes until the lamb is fully cooked. Pour the filling into a casserole pan. Make mashed potatoes however you usually make your mashed potatoes. If I have it on hand I like to add buttermilk to mine (along with butter and milk). It gives them a nice tangy taste, and means you can use less butter and salt. Dollop the mashed potatoes on top of the filling, and then spread to create a solid sheet of mashed potatoes. Lay a pattern into the mashed potatoes with the tines of a fork (this isn’t just decorative, it’ll bake up crispier if there are ridges in the mashed potato). Scatter the cheese over the potatoes and bake until the top is crusty and golden, about 25 minutes. * Maybe this serves six people who’ve had a starter and nibbles before dinner. It doesn’t feed six people at Dinner. I doubled the recipe and served 8 with no leftovers. I could have fed 9 if we hadn’t spent the last half hour of Dinner nibbling at the crust, and I could probably have stretched it to 10 with a more robust vegetable dish..
** I made this on Monday night, and then reheated it while I made the mashed potatoes on Wednesday evening. You’ll want to reheat it before you put it in the pan, or it’ll take forever to come up to temperature in the oven. *** There is far too much liquid in this recipe as it is written (the original recipe is the one I gave above). The first time I made it I followed the recipe and ended up ladling out about half the liquid before I put it in the casserole dish. This time I used about 2/3 of the liquid and I still took out a cup and a half of liquid. I think next time I’ll start at half the liquid and add more if I think it’s necessary. Ohmygod but beans on toast is the most disgusting thing EVER! Maybe it was just because my flatmate would open a can of beans on Monday…LEAVE IT OPEN IN THE CABINET… and then eat it every morning till she finished the can. (b) I think beans-on-toast is one of those things you have to have been introduced to as a child to really appreciate.